According to a study conducted by AAA, hands-free texting is actually more distracting than talking on the phone. It boils down to the task being performed and what the brain can handle. Apparently the brain stumbles hard on the task of voice-based texting, even over holding a phone in the hand. Using test subjects in their 20s and 30s, researchers conducted three layers of tests, in a lab, then in a simulator, then in a residential area on real roads. The device used was an unspecified Samsung smartphone with a hands-free device in a vehicle that was not equipped with an integrated infotainment system. 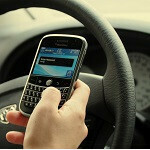 All the participants had good driving records and the researchers found that the task of hands-free texting caused a “large” amount of distraction. Holding a cell phone and carrying on a conversation posed only a “moderate” distraction. That is in line with a previous study that AAA performed where drivers navigated a course under varying degrees of distraction. More and more states in the US are making texting while driving illegal and while there is pressure on automakers to limit some infotainment system functions in their vehicles, they counter that would only result in drivers using their devices in-hand again. you hear that kids, no text while driving. Actually, according to the study I am guessing they also don't recommend talking to a passenger as well. The study found that talking to a passenger was even more distracting than operating your cell phone. I am in the process of taking a driving class....and that is considered a distraction. The radio was considered a distraction. Or maybe it was load music. If passengers arent supposed to talk to the bus driver while they are driving...I would say yea it is a distraction. IMO anything thats takes your focus away from the road is a distraction. bluetooth, hands free, speech-to-text capabilities are all self-justifiable... its the mind that needs to focus on the road - not on the phone/person on the receiving end.